We were at Ampang for dinner in the Korean village. It was an impromptu decision to make a trip to Ampang Lookout Point, the place for the view of the entire Kuala Lumpur city. We parked our car halfway of the hill and climbed all the way up. It was a short distance, we managed to reach the top after for only about 10 minutes. Once there, It was mesmerizing. A breathtaking sight that I could never forget. "Always have the camera by side" .. . and it did paid well. Unfortunately, we forgot the tripod! It was quite a daunting task taking a photo in darkness. Having little to stabilize the shot with slow shutter release, we used the edge of the fence or pillar for support. 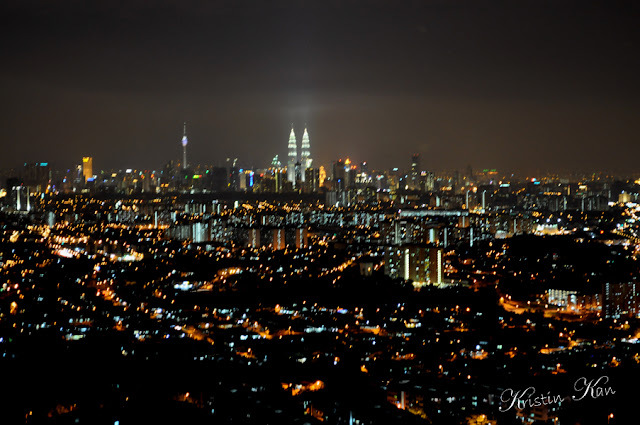 The panoramic views of the KL skyline. I wanna visit here too! P/S: I have submitted your link to Skywatch. Your sequence no is 89. Beautiful view of KL, ie without a tripod. That came out well. I almost never have a tripod when I take night city shots, as I don't take one on vacation with me, but bracing often works quite well. Especially with digital, when you can keep trying! You did well! It is an amazing sight with all those twinkling lights! This photo is full of magic! Autumn Belle: Thanks for submitting my blog post for me. Al: I think the photo needs more improvement too. I should keep trying to take better photos!